Hong Kong Imports Over 90% of Its Food. Can It Learn to Grow? In the course of 24 hours, the city consumes 931 tons of rice, 1,980 tons of vegetables, 34 tons of poultry, 4,270 pigs and 79 cows. Supermarkets, restaurants, cafes and street markets all form a complex but reliable food chain, feeding the hungry citizens of Hong Kong. Its restaurants are among the world’s best, and home to a growing array of celebrity chefs who are flocking to this urban epicenter. This Asian hub is a gastronomic center with an embarrassment of culinary riches. Yet despite all that abundance, a disquieting truth lingers on. In reality, Hong Kong is dangerously dependent on imports. Partly fueled by the city’s cosmopolitan tastes, partly fueled by its impressively capacious trading ports, over 90 percent of Hong Kong’s total food supply is imported. The nations that feed this city include the United States, Thailand, Brazil, the Philippines and Indonesia. But for all the countries that import food into the city, none can compare to the city’s behemoth supplier: mainland China. Statistics indicate that 94 percent of Hong Kong’s fresh pork and 100 percent of fresh beef hail from the mainland. China also accounts for 92 percent of Hong Kong’s fresh vegetables and 97 percent of its live freshwater fish. It’s a situation that makes some uneasy. Political and social tensions are increasingly high about China’s political hold on Hong Kong. So why are Hong Kong’s citizens so willing to rely on China for their food? Do they simply accept where their food comes from, or are they largely oblivious to this reality? The simple answer is price. With its spacious fields and affordable labor, China delivers food at the large scale and low cost that the city needs. And geographical proximity also means that transport and logistical costs are kept to a minimum. This is happening at a time when the food’s price is becoming increasingly important. As the cost of living in Hong Kong has shot up, its poorest citizens are forced to spend more and more to make ends meet, with the cost of basic staples such as rice doubling since 2007. However, the belief that China will remain as the cheap alternative is slowly eroding away. Rising food prices and the rapid devaluation of the Hong Kong dollar mean that the reality of affordable food is quickly slipping away. At a time when the city needs to confront the reality of what is happening and find long-term solutions, an alarming lethargy still exists. “Hongkongers spend too much time in malls and offices,” says Janice Leung, founder of Hong Kong’s largest farmers market, Island East Markets. “We want to get them outdoors and fostering relationships with the people who make and sell their food and other needs.” Lack of education and awareness, combined with a belief that agricultural work is “dirty” are cultural and social roadblocks, creating a city disengaged with the origins of its food. 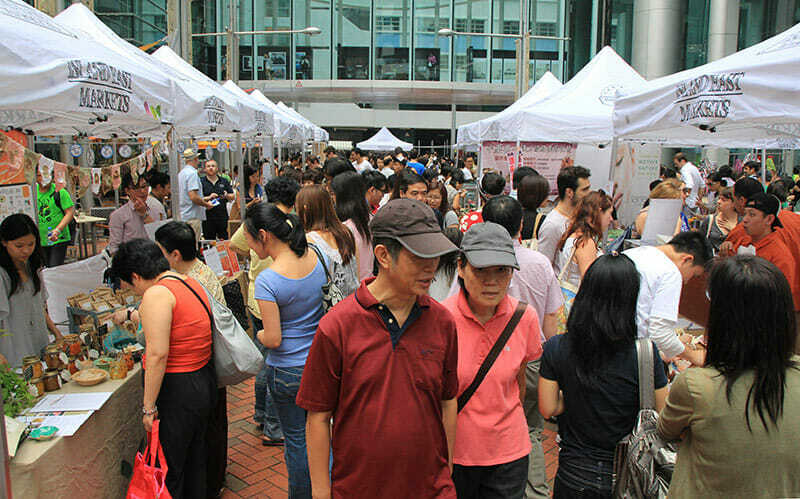 No wonder then, that Island East Markets focuses on instilling the importance of homegrown foods and sustainable living. Featuring local produce made through sustainable agriculture, what was Leung’s gut instinct and interest in local produce has bloomed into a new communal tradition. Their most recent Sunday gathering hosted over 6,000 visitors. Slowly but surely, locals are warming up to the idea of truly local produce. 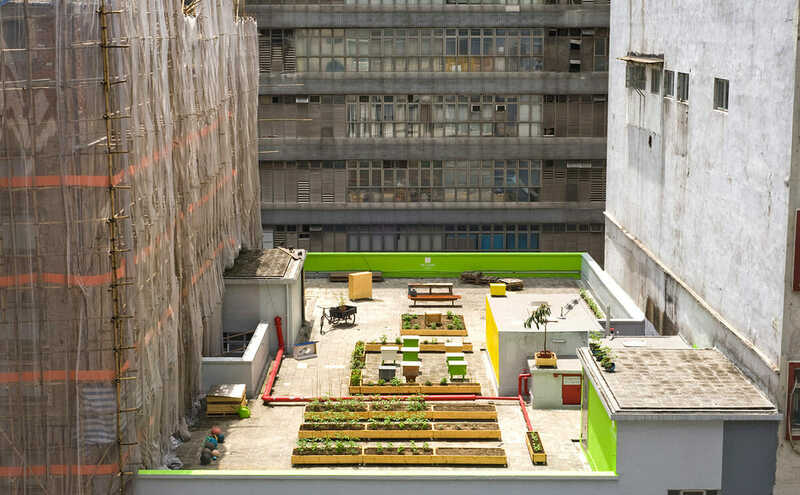 In a densely packed and crowded environment like Hong Kong, the city is also finding new and innovative solutions to farming. Rooftop farmer and urban beekeeper Michael Leung is a leading ambassador of local fare. Along with his coworkers, Matthew Edmondson and Glenn Eugen Ellingsen, the trio encourage the use of oft-ignored rooftop estate as prime places for farming. They sell their own produce, and run introductory workshops in rooftop farming, beekeeping and planter making. Leung himself has worked on New York’s preeminent rooftop farm, Brooklyn Grange, transplanting ideas from his time there and translating them to the local Hong Kong environment. While Hong Kong celebrates itself as a food mecca, the connection to its agricultural roots has become thin. For this small band of urban farmers, the hope is that citizens and future children will once again know how food is produced: with grimy hands and a lot of care.